#11, 6025 - 12 Street S.E. ESG Filtration Ltd. is a manufacturer and distributor of process and instrumentation filtration equipment for the oil and gas industry. ESG carries a variety of filtration solution products such as sample system filtration, coalescing, liquid/liquid separators, fast loop filters, pressure regulators, air/gas dryers, liquid/gas filter cartridges, filter bags (nominal/absolute), manufactured pressure vessels, carbon absorbers, reverse osmosis systems, and specialty filtration. ESG Filtration Ltd. represents 3M, Headline Filters, Suez (Formerly GE) Water and Process Technologies, Sunsep Dryers and CONCOA regulators. Our 300 Series Compressed Air & Gas Filters are designed for versatility. The many features and wide variety of filter elements provide custom protection for instrumentation, pneumatic equipment, fuel gas systems, air dryers as well as a vast array of process applications. 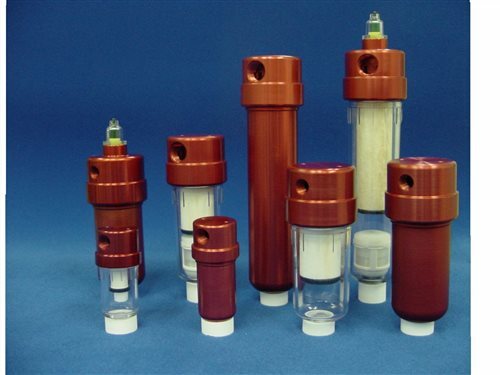 At the heart of our coalescing filter is the completely disposable C-type coalescing element. Made entirely of borosilicate glass microfiber and fluorocarbon binder, the element is compatible with all compressor lubricants and will operate at temperatures up to 300F. This element is rated at 0.01 micron efficiency to capture all the fine aerosol mist that is prevalent in copmressed air and gas systems. 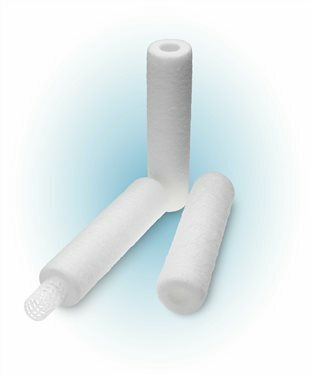 We realize that every filter application is unique, therefore besides offering our standard 0.01 micron microfiber coalescing elements we also provide sintered polyethylene (PEL) elements for bulk contaminents, and re-cleanable mesh stainless steel (SS) elements for harsh service. A pleated (PL) element is also offered for system laden with pipe scale particles or post desiccant dryer dust. GE Water & Process Technologies offers a wide variety of water purification and treatment equipment for fluid treatment. From water purification equipment for purifying municipal water sources to pumps for dispensing chemicals in treatment systems to providing filters for fluid purification systems, GE Water & Process Technologies has a complete solution to your problem. Many cartridges claim to be depth filters. But to be a true depth filter, a cartridge must be able to retain contaminants throughout the entire cross section of the filter. GE Water and Process Technologies has developed a unique one-step manufacturing process that continuously extrudes and thermally bonds pure polypropylene microfibers into a complex filter matrix. The patent pending Z.Plex™ filter technology is engineered for greater void volume than current melt blown filters. Z.Plex technology incorporates smaller diameter fibers and an innovative 3-dimensional fiber matrix that maintains structural integrity while greatly increasing filter capacity.